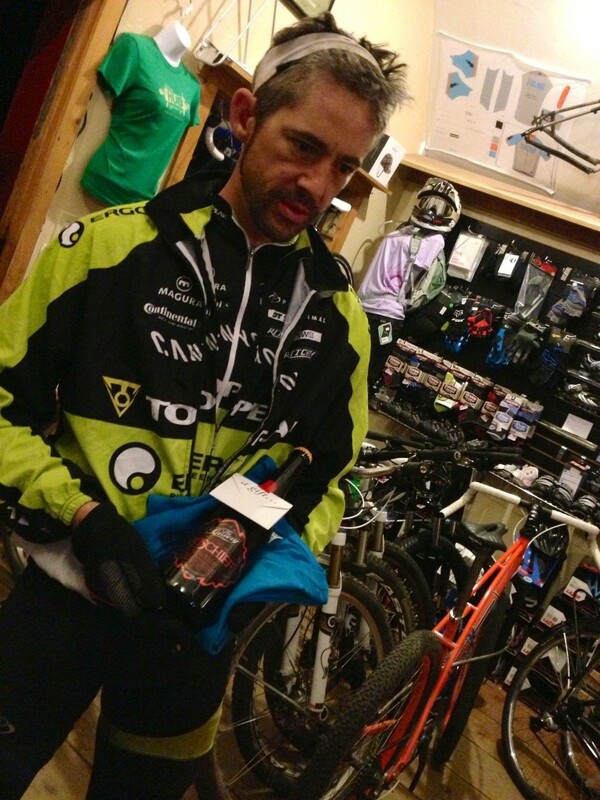 Eddie O’Dea at Hub Cyclery in Idyllwild, California, after he won the Stagecoach 400 in 39 hours and 27 minutes. 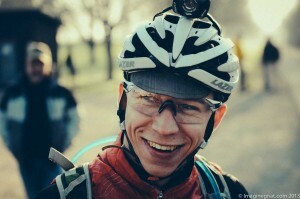 Photo from Hub Cyclery. This past weekend was a busy one for endurance mountain biking, with fierce racing in the Stagecoach 400, Trans Iowa, and Arizona Trail Race 750. The Stagecoach 400 started Friday morning under clear skies and hot sun in Idyllwild, California. A field of about 35 racers dropped out of the San Jacinto mountains and into the Anza Borrego desert as temperatures topped 90 degrees.One of the co-organziers, Hub Cyclery’s Mary Collier, said they made several changes to the route this year to carve out some of the less rideable sections of trail. As a result, the leaders set blazing record times on the course, burning through the entire 370-some miles in a single sleepless push. Eddie O’Dea managed to incrementally increase his lead on local rider Guy Sutton and defending champion Jay Petervary throughout the long day. He rolled into Idyllwild at 11:27 p.m. for a finish of 39 hours and 27 minutes, carving more than ten hours off the old record. Sutton finished at 2:18 for a 42 hour and 18 minute finish, and Petervary came in three hours later in 45:15, still taking four hours of his 2012 time. As of Monday morning, Tracey Petervary was en route to Idyllwild and in strong position to finish first in the women’s field. At least fifteen riders scratched from the race, with a handful of finishers trickling in. Alaska rider Josh Spice dropped from the Stagecoach after 117 miles, citing difficult riding conditions and complications caused by the heat. Max Morris heads down the South Kaibab Trail on the South Rim of the Grand Canyon during the Arizona Trail Race 750. In the Arizona Trail Race, Max Morris finished the 750-mile ride across Arizona Saturday at 9:30 p.m. for a finish time of about 8 days and 13 hours. While shy of record pace, Morris knocked six days off his previous time. He reported that fatigue caused him difficulty in the final miles, especially when he was required to hike his bike across the 24-mile stretch of the Grand Canyon. 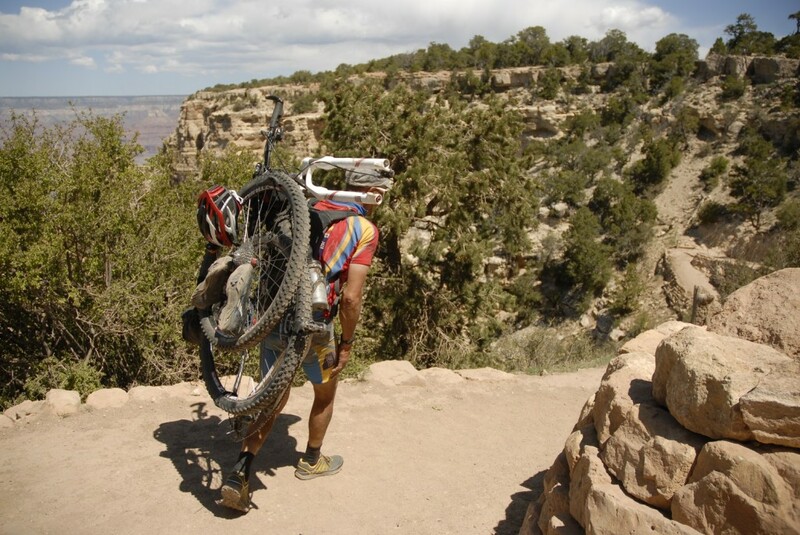 “I struggled getting the bike up the North Rim,” he said. Having also finished the Tour Divide in 2012, Morris encouraged endurance riders to take on the desert singletrack challenge. “AZT750 is a whole other world of hurt,” he said. Aaron Denberg had a bout of bad luck when his cassette and freewheel fell off during the canyon hike. He tried to zip-tie the cassette, but the zip tie wore and broke, and he lost two of the ratchets inside. When he reached the North Rim, he had a nonfunctional bike. 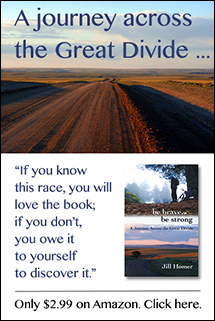 A driver picked him up on the closed access point to the North Rim, sparing him a 40-mile walk on the road, but he was forced to scratch from the race just shy of the finish. Blake Bockius also finished the race in about nine days. Eric Foster, Forest Baker, Mark Caminiti, and Sheila Torres-Blank are still en route. Saturday’s Trans Iowa brought a field of 91 starters, including a record rookie field of 51 riders for the ninth version of the 325-mile gravel grinder across Iowa. A total of 36 riders finished, which is also a record finishing rate for a race notorious for its wet weather, rough farm roads, and tight cut-offs. Rich Wince was the first to cross the finish line at 5:11 a.m. Sunday time for an unofficial finish time of 25 hours, 7 minutes. First singlespeed racer Mark Johnson finished second overall at 6:32 a.m., Paul LaCva came in at 6:40, and first woman Monika Sattler finished fourth overall at the same time. Four women finished this year’s event, also a record as only one woman has finished Trans Iowa in the eight prior events. Stagecoach 400 is an amazing event! I was feeling good all the way to Fish Creek Wash. The first 15 miles were great but the last 15 were brutal. I ran out of water and was struggling to push the bike through the deep sand. The rock wall was painful to look at and took everything I had to get it up half way. I finished at Stagecoach RV store where others souls called it quits. I was proud to have made it that far but I look forward to another attempt to Brendan and Mary Collier Stagecoach 400. Congratulations to all the riders that participated. Hope to see you all next year.